Posted on January 30, 2019. Subscribe to our blog by email. 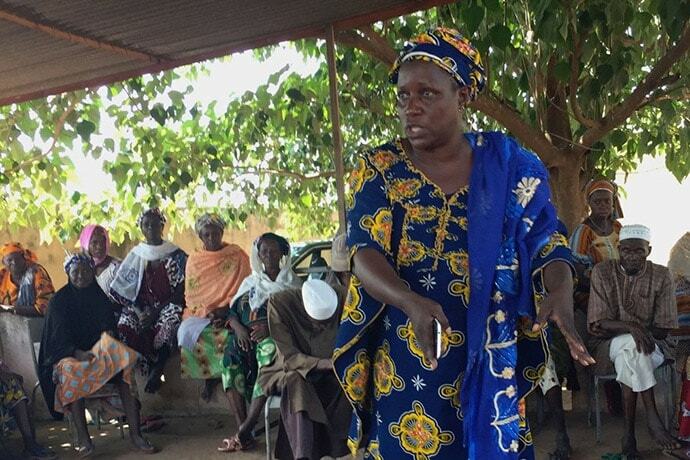 A woman in Sido, Mali, explains to the mayor why formal marriages are necessary to protect women from abandonment. This is a reality seldom explicitly spoken aloud in mixed company. In order not to alarm the men, the rationale for formal marriages is usually given in terms of access to educational and other benefits by children of formally married parents. But this woman is a poised speaker and plans to be a future politician. She speaks her mind even in front of the village elders seated behind her. (Photo courtesy of Oxfam). The answer is deeply personal and different for each woman. Recent research from Oxfam sheds some light on this question especially with respect to the relationship between women in successful savings groups and their political engagement. This research confirms for me what I’ve long suspected. Ultimately, having economic resources alone doesn’t necessarily lead to greater political activism. However, economic resources together with experiences that enable a process of personal empowerment increase the likelihood of engagement. In Mali, and likely in many places, variables in this equation include: 1) literacy levels, 2)access to civic education, 3) self-confidence, 4) the level of risk of social sanction, wherein “women avoid civic engagement for fear of transgressing their socially defined roles,” and 5) a political context where elected officials are responsive to their electorate. Basic economic stability, social capital and self-confidence are also critically important prerequisites to political action. Mara is the Associate Director of Women’s Economic Empowerment in Oxfam’s Food Systems Theme. She has over 20 years of experience working in the fields of women’s empowerment, international development, and emerging markets finance. Mara is the global lead on the Women in Small Enterprise initiative, which includes Oxfam America’s first impact investing fund that focuses on women entrepreneurs in Latin America. Prior to Oxfam, Mara consulted with the Middle East Investment Initiative, a public-private partnership of the Aspen Institute, the Overseas Private Investment Corporation, and the Palestinian Investment Fund, to develop a new form of small business insurance to help Palestinian exporters hindered by travel restrictions. Prior to that she worked at the Federal Reserve Bank of New York as an emerging markets financial sector analyst. She has worked with various international finance and development organizations, including US Export-Import Bank, the Overseas Private Investment Corporation, and the World Bank. She has an MBA from Johns Hopkins University and a Masters in Foreign Service from Georgetown University. Mara speaks fluent Latvian and basic Russian.